THE WIFE is a taut, tense relationship drama that pivots on a central mystery that is revealed at its half-way point. I will therefore review the film without spoilers and strongly advise you to avoid them before watching. 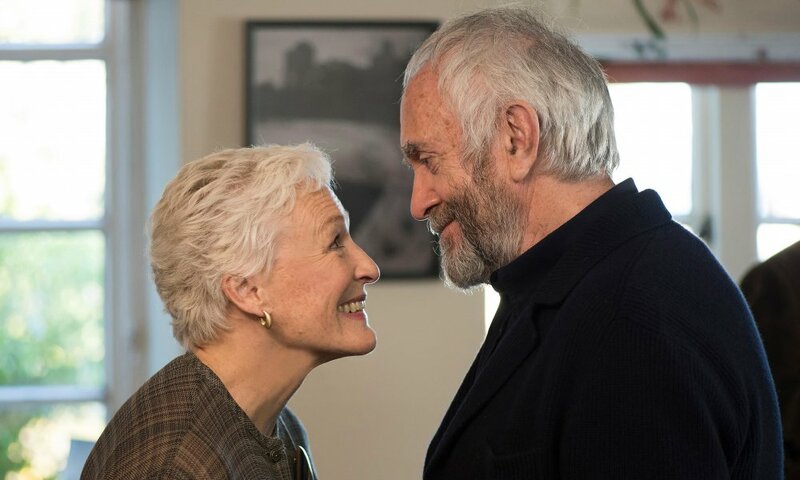 THE WIFE begins as an almost placid, banal, relationship movie about an ageing rogue of a writer (Jonathan Pryce) and his quiet, reserved help-meet (Glenn Close). She seems like a rather uninteresting character: elegant, quiet, mostly concerning herself with travel arrangements. She says little, and when she does it's to calm the waters, especially between the author and his son (Max Irons) - another putative author desperate for his father's encouragement and approval. The plot sees the author awarded the Nobel Prize for Literature to his evident glee and greed - and the whole family decamp to Sweden for a claustrophobic and intense set of press interviews, rehearsals, cultural events and ceremonies. It's in this pressure cooker environment that a literary biographer and journalist, played by Christian Slater, starts trying to ingratiate himself with various members of the family, provoking a final act unleashing of pent up recrimination. And all this is illustrated for context with flashback scenes to the author and his wife meeting at college, and trying to get published in a less inclusive time. What I love about this film is quite simply the quality of the writing (Jane Anderson - OLIVE KITTERIDGE) and acting. The writing is so taut and intense that the movie almost plays as a stage-play between the author and his wife, and I was surprised that the film was based on a novel rather than a play. That said, the film didn't suffer, as some stage plays do, from feeling artificial and stagey when put on screen. The director Bjorn L Runge does a great job of using location shooting and the grandeur of some of the ceremonies to open up the visual scope of the film. Nonetheless, this film is a chamber piece and lives or dies by the quality of its acting. And like its protagonist, THE WIFE is a movie that is quiet, elegant, unshowy, but with profoundly held emotions. Glenn Close plays Joan with a stillness that's echoed in her younger flashback self, played by her real-life daughter Annie Starke. We see both avatars observe, absorb, almost passively. It's a set of beautifully controlled and thus powerful performances that play powerfully against Pryce/Harry Lloyd's bombast. Of the minor characters, I also really loved DOWNTON ABBEY's Elzabeth McGovern as a jaded female author. As the movie rolls into its final act, what I was concerned about was that it would sacrifice the slow build of creating a nuanced character for a pyrotechnic showdown, but no - that confrontation when it comes rings true to the characters it had established. All of the wife's actions and reactions felt authentic, plausible, even admirable. And I loved the rather delicate, slippery final shot. THE WIFE is rated R and has a running time of 99 minutes. It played Toronto 2017 and was released last year. It is now available to rent and own.